I know there’s gotta be some B movie out there where a deranged killer cuts of his victim’s head and uses it like a bowling ball. Unfortunately, I can’t remember because all of those movies all kind of bleed together. (Ha!) But these gory severed heads aren’t rotting in some sicko’s basement—they’re providing some good scares in bowling alleys across Germany. 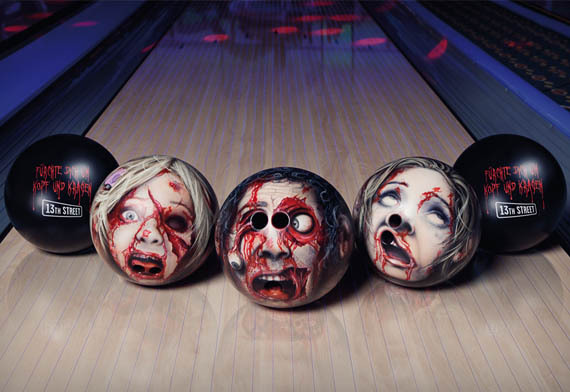 Some of the regular balls were swapped out for 13th Street Bowlingheads to promote the German horror TV channel, 13th Street. Each bowling ball features a gruesome 360 degree head, painstakingly hand-painted by artist Oliver Paass.